With the excitement that comes with relocating your business and expanding, moving can seem difficult. Often, moving companies will get the job done for businesses, and that’s the best option. Although a moving company can take care of the actual packing, loading and unloading, it’s still your responsibility to prepare beforehand, especially because you’re accountable for business property. Before speaking with a mover, start accessing what you’ll need moved. Take into account the size of your office furniture to ensure you can get through the door in both locations. Also, be aware of important documents that may be stored in filing cabinets and drawers. Organize this material and make sure to ask about insurance for these types of things. If you can secure documents by creating digital files, this will eliminate the chance of losing them. Create an in-house moving team and segregate individual tasks. Communicate within the business also with moving dates and deadlines to ensure that personal items are packed, labeled and organized, depending on if they will move their items or the movers will handle it. Create deadlines for employees, management, movers, etc. and ensure everyone knows about refrigerator cleanup. Notify movers of office machines, large filing cabinets, bookcases, shelving, etc. that may need special moving equipment. Overall, creating checklists and dividing the tasks between an internal moving team will help your office move go smoothly. Also, ask your movers for tips. Stay tuned for more on office moves. Better Homes and Gardens put together a great list of 10 moving mistakes. 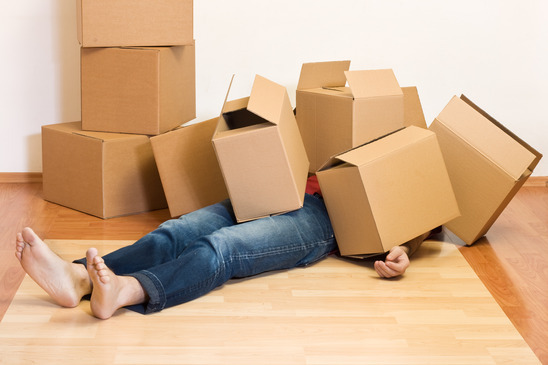 Avoid these by hiring a professional mover or prepare beforehand so your move goes smoothly. It may be true that moving by yourself or with friends is more cost effective, but professional movers know the ins and outs of moving. If you are doing the moving and packing yourself, make sure you research all of the moving details. “In the end, a do-it-yourself move may not be as ‘cheap’ or as fun as you thought (that would be about the time you drop the TV on your foot or discover the truck is fully loaded but a third of your house is still on the sidewalk),” the article states. Find out before you hire your movers if they have an insurance policy. This ensures your belongings are accounted for and protected if they are broken or lost during a move. The article calls this a survival kit. This can be a small carry-on bag or entire suitcase, depending on what size move. This ensures you can “survive” for at least one day while you’re moving. These are just a few of the important tips Better Homes and Gardens includes in their list of mistakes. Read the full article. Moving into a new apartment is exciting and refreshing, and often, you want to move in right away. But inspecting the apartment while the space is clear is best. Inspecting the apartment ensures the landlord and yourself take into account the current damages, if any, so when you move out, you aren’t charged. To account for any damages, its suggested that you review the apartment with the landlord and you take pictures of each room. Make a list of the damaged areas or items and make sure you and your landlord have a copy. If the items will be repaired, make sure you get some type of receipt and your landlord gets a copy as well. Immihelp.com has a checklist of items to check in your apartment prior to your move in date. Bathrooms — Is everything working? Are there any leaks? What’s the condition of everything, including chips, mold, etc.? Bedrooms — Is anything broken such as shelves, furnishing, closet items? Is there any mold near doors, windows or on the ceiling? Interior items — This includes checking the walls, plaster, ceilings, lights, carpet, fans, drapery, furnishing, electrical outlets, etc. Kitchen appliances — Does everything work? Are there any leaks? Security — Are the doors sturdy? Do the locks work? Are the windows secured? Do outside lights work? Addressing these things with your landlord prior to moving in also gives them peace of mind. Taking care of this extra inspection will also save you money in the end. Today, we’ll determine if it’s better for you to pack your own dishes or have your movers pack them. Well, that was a pretty simple answer. It’s actually best if you have your moving company packs your dishes for you. This is because they are reliable to any broken items in damaged boxes that occur along the way. Also, they have all the appropriate supplies to ensure your dishes are safe and transported correctly. Wrap each plate, cup and other dish by itself. Don’t try to wrap three dishes at a time; this will result in broken plates. Stack your wrapped dishes vertically in the box. These are some of the basic tips to wrapping your own dishes. If you’re in need of packing services for your dishes, though, or for any part of your moving experience, Two Guys Moving can help. Call us at 210-433-MOVE. Today, we’re talking about labeling your boxes. This is beneficial if you’re packing an apartment, large home or office space. Yes, there’s actually a right to label all of your belongings. First of all, label them as you pack so you don’t forget what each box is. Also, pack similar items together that will go together in the new location. It’s also important to label your boxes on the sides (not on top) so you can still stack boxes and see the labels. This is the easiest, most convenient way to get help with your moving needs.